Do you waste a lot of time outdoors? Do you really like to go through the junk in the attic of the basement? A flashlight is the best tool to have around when electricity is not available. This why we decided to prepare the SureFire 6PX Series LED Flashlight Review to discuss the details of this product to help you with your purchase decision. When you are buying a flashlight, you need to make sure that you are buying something that is real value for money. You do not want to waste a lot of money on a flashlight that will break down after a few uses. By doing a little research, you will be able to find the right product. 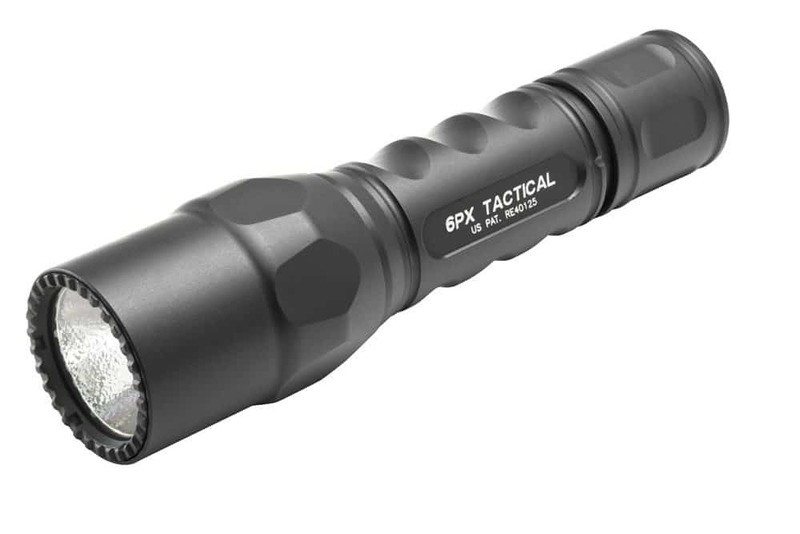 This high quality LED emitter will regulate the amount of light you get from this SureFire 6px tactical flashlight. This means that you will get the maximum light from the electric power of this flashlight. This LED emitter is indestructible, and this means that you can use it in every situation and it won’t crash or break. The high quality LED emitter will optimize the power of the best flashlight giving you the strongest light for the longest time. This means that your flashlight will last longer than similar products on the market. The SureFire 6px tactical flashlight comes with a handy tail cap that will allow you to use it any way you want to. You will be able to set it for a temporary function by pressing it, or you can have constant light by twisting it. This means that you can save power and use the flashlight the way you want to. This high-quality flashlight comes with 320 lumens for the highest quality of light with a high output level that will work on any darkness level. The micro-textured reflector will create a smooth, optimized beam that will shed light to combat the darkness in every situation and context. This SureFire 6px Tactical is the best flashlight to use because it has a body made from high-quality aerospace aluminum. Aluminum is known for being super durable and sturdy, and at the same time, it is very light. Your flashlight will not break, and it will be so easy to carry around because it is not heavy. A durable, high-quality flashlight that is made from light aluminum that won’t break. Easy to use with a versatile tail cap that can be pressed for a temporary light or twisted for continuous light. This means that you can easily change how it works to suit your preferences. A high-quality beam of light that will disperse the darkness thanks to 320 lumens and a micro-textured reflector. A LED emitter to optimize the quality of light and the runtime so that it can last longer and work better. It doesn’t come with a belt or a pocket clip. It has one light setting that is very bright. If you choose the pro model, you will be able to enjoy two light settings, one high for tactical purposes and one low for map reading and activities that don’t require much light. The light can be too high which could temporarily blind others, but at the same time, it could be an effective tactical weapon. Q: Where is this flashlight manufactured? A: It is made in California, USA. Q: What about the quality of the batteries? A: This flashlight comes with batteries, but they are not rechargeable. This means that you will have to replace them regularly, but they will probably give you from 2 to 3 hours of continuous use at the high setting. This means that they are really durable. Q: What can I use this flashlight for? A: This flashlight will provide the necessary light needed on an outdoors trip, on a camping site or if you are doing some work in your car at poor lighting. It is a highly versatile small flashlight that you can easily carry around and will last for a long time. Q: Does this flashlight have the strobe option? A: No, the strobe option is not included. Q: Is this flashlight water resistant? A: It is safer to say that it is waterproof. This means that you can probably get away with using it under water but only for a short period. Finding the best and most reliable flashlight is not an easy task. You need to buy something that will last for long and will be good value for money, and we think that by preparing the SureFire 6px Tactical Flashlight Review we have found an excellent product. It is made from high-quality aluminum, and this makes it durable and light. It will give the best quality of light through an extraordinary LED emitter that will optimize the light output and the run time.